For a number of years I lived in a tiny house with horrible storage space. Removing anything from my closet was like playing the dangerous version of Jenga, with heavy, head-bonking cardboard boxes standing in for the little wooden rods. What did I hate more than pulling everything out of the closet to find the one-needed thing (that was always in the back)? The time it took to repack everything, Tetris-like, so I could close the closet door. My time-saving solution to this problem was to stack items that I removed from the closet on the floor outside of the closet where they'd be easier to see and grab. Every other month or so, I'd decide to throw a party. Part of the party prep was spending two unhappy days putting every single thing I owned back in its proper place. It was a most annoying method of keeping house. Finally, I realized that I hated organizing my stuff more than I enjoyed owning it. My solution to clutter wasn't to have a space for everything, it was not having things that needed to be stored. Fewer things. Fewer things to put away. So, on November 1, 2001 I made a resolution: I would get rid of 10 things a day until I had downsized enough that I could fit all my belongings into one, visible layer in my closets. The 10 items rule was arbitrary. Ten things seemed challenging enough to turn downsizing into a game (always a bonus for me), yet achievable enough to allow me to complete my goal even on the busiest days. One day, at the end of March 2002, I came home to a noticeably neater house. After almost five months of downsizing by 10 things a day, I had painlessly removed almost 1500 items from my home. Multiplication is what makes 10 Things a successful organizational strategy. Ten is a smallish number. But 10 things a day equals 300 things a month equals 3650 things a year! It was at this point that I realized why speed cleaning methods had never been the answer to my clutter. 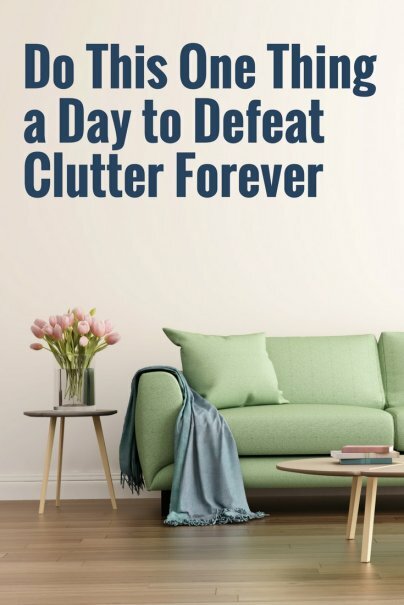 My house didn't get messy in a week, so it was unrealistic of me to believe that I could declutter my home in the same time frame and be happy with the results. Since I only had to remove 10 items every day, it gave me time to consider what things would go and come up with an optimal plan for their disposal. 10 Things is like yoga, something you practice rather than an end goal. While it fails to provide immediate gratification, 10 Things provides what other organizational systems do not: an easy method of maintenance that doesn't just clear clutter, but prevents clutter from building up in the first place. Over 13 years later, I am still getting rid of 10 things a day. My house is tidier than most, and my material goods cause me a lot less stress. My weird organizational system works! When I tell people who haven't found success with other organizational methods about 10 Things, the same questions always pop up. So here's exactly how I do it. What Qualifies as a "Thing"? A Thing can be as big as the old car I sold to my co-worker, or as small as the dried out felt-tip pen that I just threw in the garbage. Clutter is personal. My cherished object could be another person's garbage. I define clutter as any item in my house that isn't necessary for the basic function of my life that also doesn't make me deliriously happy. Do You Have a Time Slot Every Day to Find Your 10 Things? No. Some of my friends set timers to force themselves to make quick decisions. (Plus it's more fun to race the clock and try to pull all 10 Things in one 20-minute period.) Because some of the things in my house need a more elaborate disposal process than just getting put on the curb or in the recycling bin, I give myself all day to find and dispose of the 10 Things. Some days are easy because I will have a garage sale and divest myself of 100 items before lunch. And then there are those days when I am digging through the spice cabinet in my kitchen at 11:58 p.m. trying to find 10 little condiment packets left over from take-out meals that I can donate to the food bank. What Do You Mean "Get Rid Of?" Are You Throwing Everything Away? Occasionally I will get lucky and actually wear something out. In that rare instance I will actually throw something in the garbage. But, by "Get Rid Of" I mean "Leaves My Possession." I can get rid of the old paint in my garage by taking it to the Poison Control Center for disposal. I can donate old furniture to my local charity. I can collect all the random blue ballpoint pens (I only write with black ink) that have found their way into my home, and give those to my favorite waitress or leave them at the bank or post office for others to use. I can freecycle an old printer. I can sell a vintage lamp on Etsy. I can ship that vintage lamp in a used cardboard box. I can drop my old magazines off at the hospital's waiting room. The only thing I'm a stickler about with 10 Things is that the items have to physically leave my possession. It doesn't count if the item is in the trunk of my car, waiting to be dropped off at a friend's house, or on the porch, waiting for the Craigslist buyer to pick it up. It must be gone, gone, gone for good to be counted. What Should I Get Rid of First? I know this will sound obvious, but get rid of the things you hate first. Clutter often builds up because we keep things around that trigger memories or are valuable collectibles. By starting with the things that I hated, I accidentally discovered another reason why 10 Things works — it makes downsizing less stressful, because I never have to make a Sophie's Choice about objects that I care about. I'm always removing the 10 things I like the least in my house. It's pretty hard to make a case to keep things that I am categorizing as my "Bottom 10" possessions. Always choosing the worst of my possessions also means that in thirteen years, I haven't regretted a single choice. Another bonus of 10 Things is that, over time, it trains the eye and the brain to be more discerning. Because I am always removing the least worthy items from my house, over time I've distilled and curated my possessions into a collection of things that are beloved, functional, and give me pleasure. Do You Keep Track of Everything You Get Rid Of? Yes. I keep a running total of everything I get rid of in a little notebook. It's weirdly rewarding to see my daily 10 Things written down. It also keeps me honest and accountable. I have a friend who takes a photograph every day of her 10 things. She likes her photo record because it means she doesn't need to keep physical souvenirs to remember things by. I'm still waiting for somebody to blog or Instagram their 10 Things campaign. Do You Keep Track of Everything You Bring Into Your House? The practice of getting rid of 10 things a day has absolutely made me a more aware consumer. Now I can't acquire something without automatically thinking about when and how that item will leave my home. Knowing that I have to have an exit strategy for each thing that comes into my house makes me think twice about bringing new items home. I have become extremely choosey. It's a wonderful and unintended side effect, which helps me keep my home clutter free. Not to mention what it's done for my spending habits. You Have Been Doing This for So Long — How Do You Still Have Things in Your House? Because I live in a First World country where people waste resources. Even though I am a minimalist by American standards, I am a maximalist relative to most of the rest of the world. Also, I work out of my home, so every day is a war on paper. Also, I have to admit that I still tend to hoard things like envelopes and glass jars, things that other people would just recycle. While school supplies and storage containers are just temporary visitors in my home, I currently have a bigger collection of both than I'd like to have on hand for personal use. So I'm using the surplus as an incentive to get an early start on handmade holiday gifts of jam and pickles. I will always struggle with organizing my house more than the average person. But, with 10 Things, my clutter has become a starting point for creative projects, not the end point of unconsidered acquisition. Do you have an unusual organizational hack to keep clutter at bay? Please share your genius in the comments section. I did my downsizing ala Dave Bruno, the 100 Thing Challenge. Thus, I can no longer get rid of 10 items a day. I don't run a business out of my home and I have ceased purchasing everything that catches my eyes. The less I purchase, the less chance of my space becoming overcrowded with stuff. Good post for people who have not pared out the useless items in their lives. Speaking of downsizing . . . I bought a new pair of jeans and two new tees. Now I have to select an old pair of pants and two tops to drop off at the used clothing center. The "1 thing in 1 thing out" rule also helps me stay on track. I applaud your minimalism! My brain definitely works better when I have less visual noise. I recently worked overseas for three months, and all my possessions had to fit into one laptop bag. It was amazing how much free time I had because I didn't have to waste time taking care of material things. You don't really realize how much time is spent taking care of possessions until you don't have them. But, downsizing to even 1000 things is a frightening prospect for most people. Americans have been taught that minimalism=deprivation. Imagine how impossible 100 Things Challenges sound to the average person who has more than 100 things just in their bathroom drawers. A great book to read on the subject of American consumerism is LIFE AT HOME IN THE TWENTY-FIRST CENTURY, which is based on a 9 year study by UCLA anthropologists who studied 32 American homes like they were on archeological digs. They discovered that the average, middle-class, American family home contains 250,000 items! Americans are super consumers. For example, Americans have 3.1% of the child population of the world, but buy 40% of the toys. We've all been taught to buy in bulk to save money, but we haven't been given a plan to get rid of all the things we acquire. I also use the "1 in, 1 out rule," which is a great maintenance tool. Thanks for your insightful comment. That is really awesome. I have a question though, what do you do in your spare time? I would think that 100 items would be most of what you need to live daily-clothes, toothbrush, dishes, etc. Do you have room for any hobbies in that 100 items? Thanks for this article. I'm not sure I could drive somewhere every day to drop off 10 things, but I could certainly get them together and perhaps make one trip a week on the weekend. Whatever works for you, as long as you pull the 10 Things every day and put them some place that they don't accidentally get reabsorbed into your clutter. I have several tote bags in that are for the post office, the used bookstore, the homeless shelter, etc...I put things into the tote bags and then drop the stuff off at its final destination, when I'm running other errands in the area. I DO NOT get to count the items until they are officially out of my possession, but I'm not generally running all over kingdom come every day. The other thing about this practice is that it has made me really learn about the free/barter economy in my immediate neighborhood. I started a "Trading Post" in my neighborhood on the stairs to what is now a vacant lot. I drop things that are still useful, but wouldn't sell at a thrift store, off at the stairs. My neighbors have started doing the same thing. I walk past the stairs every day and have never seen anything last more than 24 hours. It works like a neighborhood "FREE" box. I also use the freecycle, reusit network, and free stuff on craigslist for bigger items. People pick up the stuff from my front porch, which saves me time. I also recommend joining forces with a friend or two. I rarely have to drop off donations to my local school, as I can usually get a student to pick up the stuff on way to school as they walk or drive past my house. This is a good community builder because it forces me to interact with my neighbors. Finally, I get rid of a lot of things via my local charities. I've asked my local battered women's shelter, Boys & Girls club, grade schools, etc...what they need. When I come across something on the charity list in my house, I put it into my daily tote bag, so I remember to drop the item off when I'm walking around my neighborhood. As you can probably tell, I do a lot of walking in the process of getting rid of things. However, this has allowed me to get rid of my gym membership, so that's an unexpected perk of this practice. Working as a consultant I got used to staying in a hotel for extensive periods at a time. (Not nearly as much fun as people think it is!) But it makes you think more organized so you can pack everything in those 10 minutes after breakfast and before checkout, and not leave anything behind.